This is the first in a planned series of books about now-vanished railroads of the western New York state region. This area, centering around the city of Buffalo, greatly impacted the fortunes of the railroad known as the Lehigh Valley. Buffalo shared in the company's slow rise to success and its equally slow decline to oblivion. 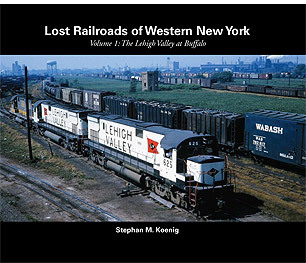 This first volume, with 118 b&w illustrations, details LV freight and passenger operations, facilities and motive power in the immediate area of Buffalo. It also provides a series of "before and after" photos comparing historic LV landmarks with scenes of the same locations today.